From Sharm El-Sheikh you can dive Ras Mohammed, Ras Umm Sid, the Straits of Tiran and wrecks like the Thistlegorm and Dunraven. See also our page on recommended diving centres and liveaboards in Sharm El-Sheikh. "We've been diving in Koh Tao, Cyprus & South Africa. Snorkelling a few other places. It's in another league." "Sharm has a good spots to dive but only rarely you'll see sharks. The only way to be almost sure to see some hammerheads is in the summer by the morning in jackson reef. You need at least 6 people to make the trip and must be at least advanced diver. If you want to see blue spotted stingrays and groupers and turtles of course its good to come to Sharm but if wanting to see some sharks better go to Elphinstone. I went to Sharm twice and saw a oceanic white tip in Middle Garden I think it was the first time and we were all already out of the water "
"I loved all the sites, with Shark reef and Yolanda among my favorites. I was impressed with the number of fish and species. I have been to Belize, Roatan and the Bahamas prior to my October trip to Sharm. The numbers of fish in the Red Sea were huge by comparison. See what comes when you protect the reefs for 50 or more years! " Jackson reef is marked topside by a rusting wreck. Beneath the sea the reef is covered with beautiful corals and anemones. 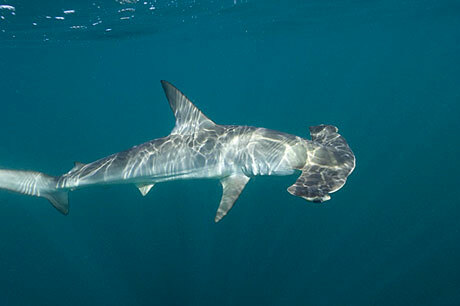 Look out into the blue for the chance to catch sight of pelagic species like hammerhead sharks. "Drift dive on south side - Jackson is a jewel for fans of coral and lots of fish - Jaw dropping underwater scenery and kaleidoscope colours!" "Getting lost in the colours, a coral grouper under every coral head, the thrill of hammerheads in the summer and fun in the currents! " "In one single dive I've seen 10 manta rays, 2 hammerheads and a whale shark. " A beautiful reef and our boat was the only one there so we weren't cramped for space! Absolutly fantastic, might be beyond limits for recreational diving but well worth doing a course just to see it. One of the best dives (that we did around Tiran Island) was probably the shallowest, to the wreck of the Kormoran. Located north of Tiran Island, the twisted structure of this large container ship is only six to eight metres below the surface and is surrounded by prolific coral that has been stained by the ship's cargo of phosphorous. The torn metal provided an insight into the sheer power of the sea. One of the prettiest coral reef walls I've ever drifted by, the disney of diving. My fourth dive of the trip was the most memorable, a speed boat ride to the dive site named Million Hope, the wreckage of a 26,000 ton bulk carrier that is over 560 feet in length which sunk in June 1996 and is said to be the largest ship ever to be lost in the Red Sea. Lying in 24 metres of crystal clear blue water and sitting on a sandy bottom, some of the upper deck is still visible above the water. A massive hole in the hull provides the opportunity to swim inside the ship. Elsewhere the cargo holds are empty after a long salvage operation, but the space provides a haven for thousands of colourful fish of all shapes and sizes. Coral is starting to grow on the deck of the ship which picks up the sunlight shining from above, giving an effect of disco lights as the various colours are picked out. Rammy my dive buddy and guide from Aquarius Dive Centre has visited the wreck so often that the locals have renamed it Rammy's wreck. His knowledge of what lies inside the ship out of sight of many divers provided me with a growing confidence that intrigued me to see more. Following Rammy down inside the dark rooms, one by one we travelled deeper until we got to the tool room and finally the engine room, but only with Rammy's torch were we able to see the workbench and huge metal tools, each one sitting in its holder as they did when the ship hit the reef and sunk 16 years ago. The more I saw the more I was fascinated, it was a truly remarkable experience, but a quick look at my gauges signified that I had used up my allotted amount of air, and it was time to start our ascent to the surface. Ras Mohammed is the headland at the southern most tip of the Sinai Peninsula, overlooking the juncture of the Gulf of Suez and the Gulf of Aqaba. 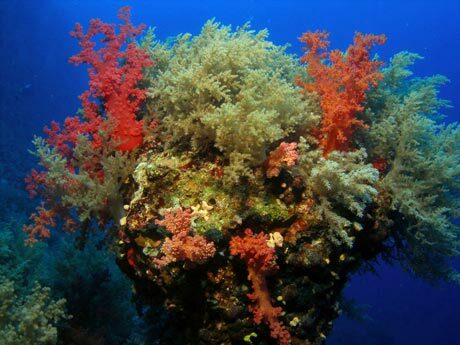 A marine reserve since 1983, includes Shark and Yolanda reefs, and the straits of Tiran. The best dive site I�ve ever seen. The coral reefs and the sea life there are an absolute treasure. Deep with coral and marine life. Currents make this good for drift dives and for pelagic fish. A popular dive starts at Anemone City before drifting to Shark Reef and its drop off. Finish up on the wreck of the Yolanda with its cargo of toilets. Currently voted one of the top ten dives in the world. "I have been diving there before and its amazing place where you can found all of kind of fishes and so beautful corals." "Just the most incredible reef gardens, so much colours and little fish with the occasional big fish too"
Best done as a drift dive dropping in on Anenome City. Then swim across blue for a few minutes to hit shark reef, a huge pinacle with a sandy plateau at about 9m on one side and a drop off to infinity on the other! Whichever side you choose the current will take you on to Yolanda reef, another pinnacle with the scattered cargo of toilets and the remaining part of the Yolanda. Fantastic colour, soft corals, every type of small fish, as well as huge Napoleon Wrasses, turtles, giant morrays, rays, jacks, tuna, barracuda and sharks. Stunning! Our first dive of the day was Shark and Yolanda Reef which offers spectacular coral, bizarre fauna and a great selection of fish that included several huge moray eels, a couple of crocodile fish, several pairs of lion fish and our first ever sighting of a rare scorpion fish which is a magnificent pink, yellow and turquoise, plus a couple of huge turtles. One of the most unusual visual effects in the world is created by the hundreds of toilets, sinks and bath tubs that are scattered across the soft white sand around the wreck of the merchant ship Yolanda which sank in 1980 together with its cargo of porcelain toilet fittings. The exhilaration of the wall followed by the beauty of the corals round Yolanda. Getting lost in the awesome schools of snappers, emperors, unicorn fish, jacks and barracudas in the summer. Wow. 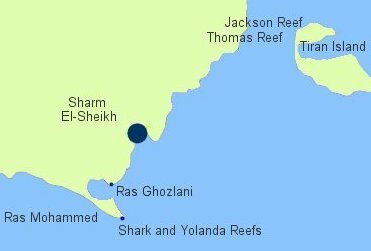 In Ras Muhamed national park Shark and Yolanda reef is beautifully preserved. In the summer months many fish school in this area and you have an oppertunity to see the strange cargo of toilets from the wreck Yolanda. A visit to the blue also always uncovers other bigger fish such as shark. Three reefs together actually. Great diversity of critters and coral. Starts with a great cave dive. Once again we were treated to an array of coral, fauna and spectacular coloured fish of all shapes and sizes, plus another sighting of a turtle. Incredible fish life and drift diving feels like flying. Many large wels, manta's, white tip Sharks. Great visibility and a lovely easy drift. For details of the wrecks near Sharm El-Sheikh, see our Wrecks Diving in the Red Sea page. This includes details of the Thistlegorm, Carnatic, Ghiannis D, Chrisoula K, Barge at Bluff Point, Ulysses, Rosalie Moeller, Dunraven and Kingston. More details are also in Shipwrecks from the Egyptian Red Sea and Red Sea Wrecks Northern Egypt. Add your comments on diving in the Red Sea. Do you want to recommend a dive operator or dive site? Let us know.